The warrior was meant as an illustration to one of several stories which I wrote back in the early seventies. 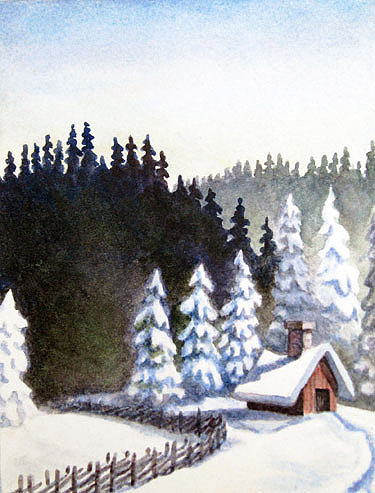 Home sweet home was something I did while attending art school in the mid seventies. What I used here were my precious, British made Windsor & Newton water colours with a few tints added using the German equivalent Schminke. 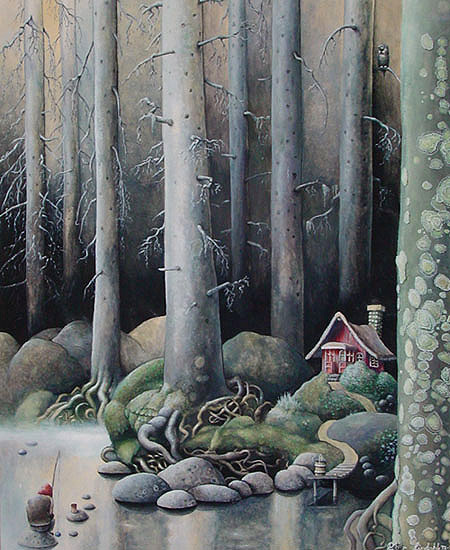 Deep in the forest was painted using water colours and tempera blocks back in 1972. 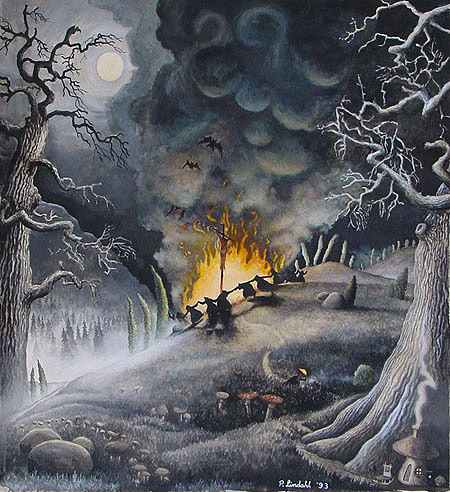 It was like The lord of mushrooms and The Dance of the witches an illustration meant for a saga which I was writing at the time. I never completed the story but, nonetheless, the picture hangs on our livingroom wall for most of the time as part of my private collection. 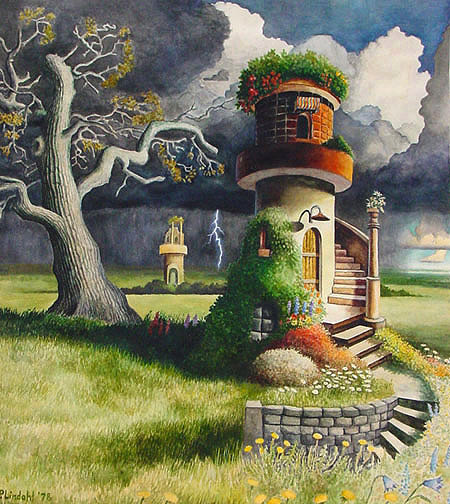 Towers was the painting which I intended as the front cover for our first In the labyrinth album The garden of mysteries. However, somewhere in the process it was swapped for the painter with the funny hat. And so by the initiative of designer Anna Spång it ended up in a rather obscure place hidden in the plastic tray underneath the disc. 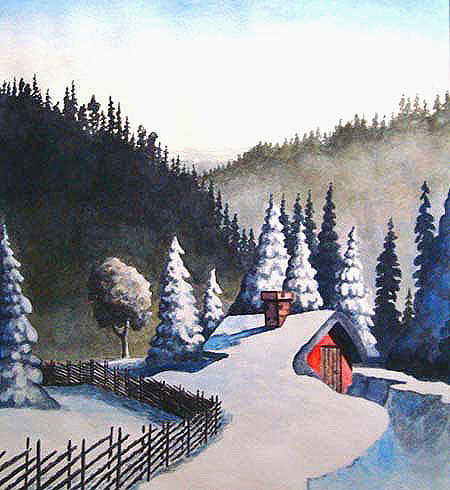 I´ve made a total of four or five versions of this picture with the last one never to be completed. Here to the left is what an earlier version looked like while the very first sample was a paper cut out of the tower itself. I´ve always enjoyed drawing buildings and houses, also to fool around with themes a bit like what Esher once did, to mimic those strangely contorted houses and architectural constructions of his. 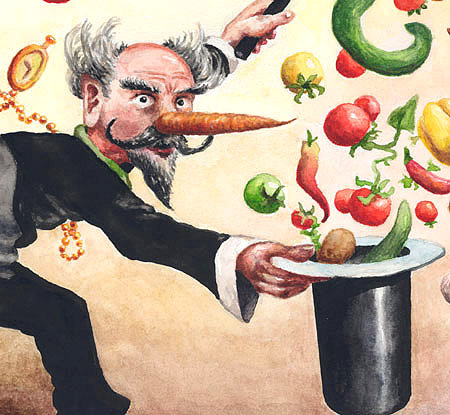 The Magician is something I did in 2004 on assignment by Dario Antonetti for Volume 3 in Oggettivolanti´s Vegetable man series, which in fact is a homage to the psychedelic genius of Syd Barrett. 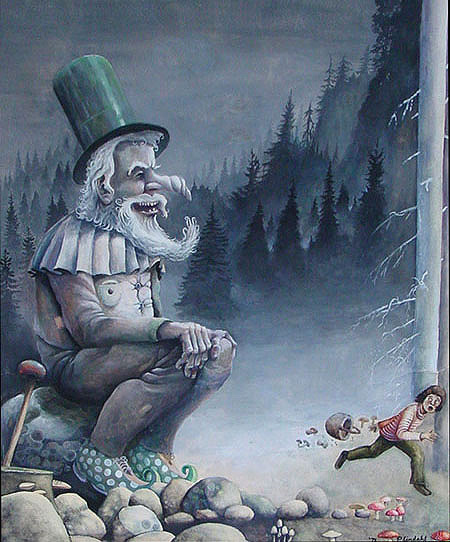 This is the central part of the painting where the sorcerer offers you to pay attention to his conjuring tricks. 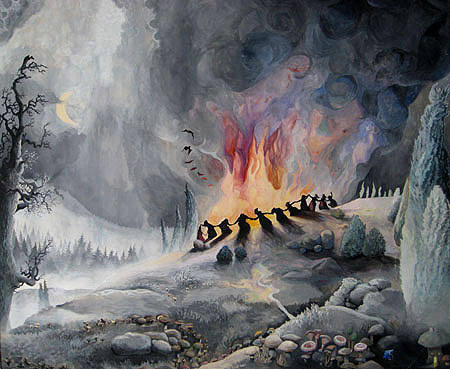 The dance of the witches was painted by me in three different versions, one for each decade starting in the early seventies. This is the last one, which I worked on over a long period of time. Dance of the witches in the oldest version from 1972 when I was still using simple water colours like the ones kids use at school. 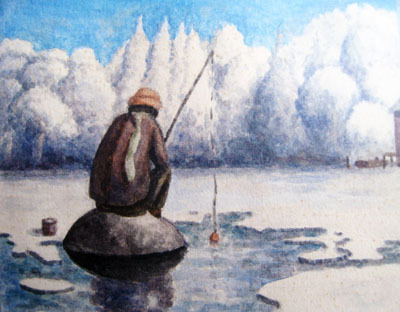 Like some of the other "gray" paintings I made during that period, this one was meant as an illustration for that same, unfinished saga. 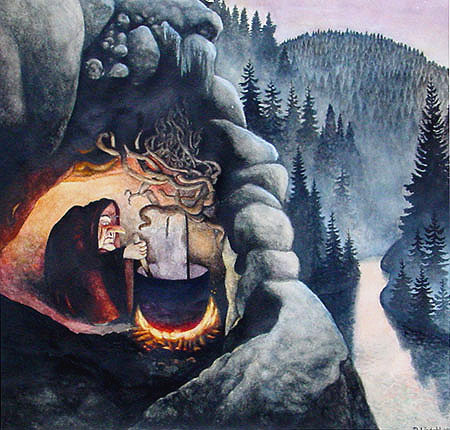 The witch in the hollow is yet another one of those paintings I made in those days when I was totally overwhelmed by Swedish illustrators like John Bauer, Tove Jansson and Elsa Beskow. 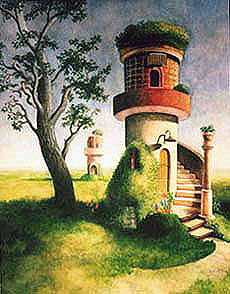 The lord of mushrooms was also initially part of that fairy tale story which I didn´t complete. 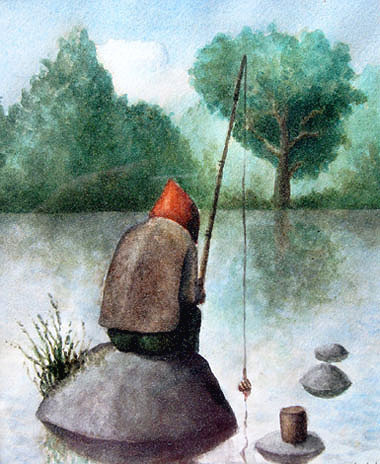 The character itself is a kind of a gnome perching out in the wilderness, luring people to walk deeper into the woods until they lose their way. 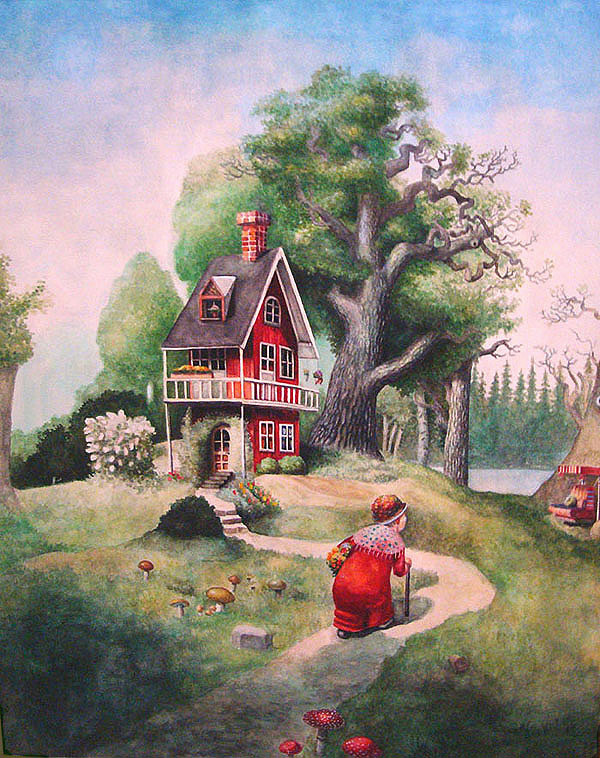 And beyond any certainty it´s the unsuspecting mushroom pickers who take the biggest risk of ending up in his yarn! 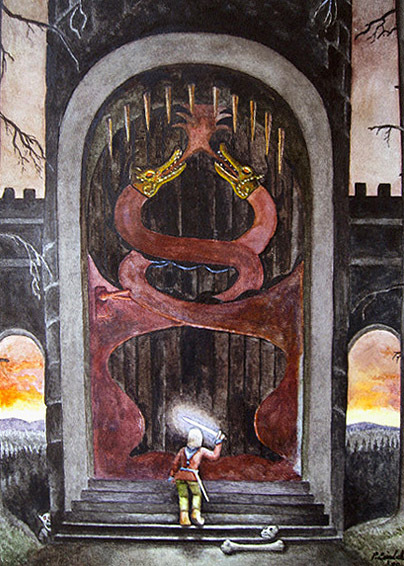 The Dragon Portal is a variation on the "Warrior" theme, this time with a more victorious, young knite ready to face up to his destiny. 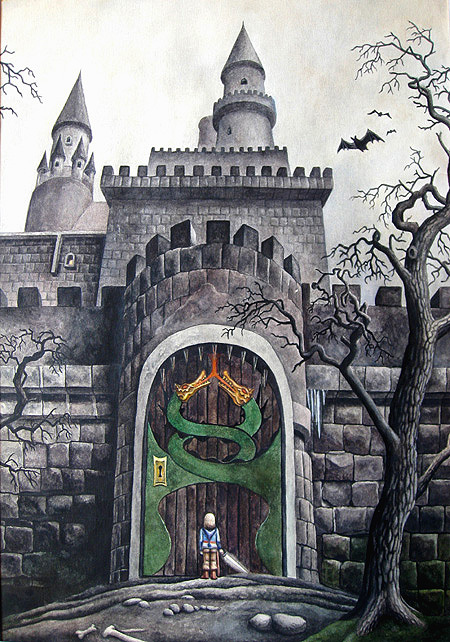 painted for an art exhibition in the early 80s. 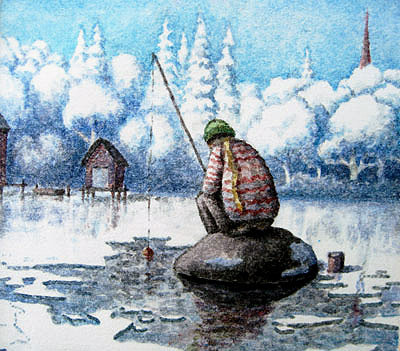 Fisherman on the ice was a theme I repeated several times. the same rock but now in the midst of summer.